Want to know how to increase sales and build brand awareness? investment. Promotional products, pens, bags, key chains etc. are all excellent marketing tools for any business. Our products can be fitted nearly in any market, as business gifts, in client retention programs and for client acquisition. These products help keep your business/team in front of the customer, a small voice reminding them in the back of their head – you are out there and ready to help them. They can also be tailored to fit any industry. Medical office -how about some custom printed bandage keepers? Tax and accounting preparation? You need those stress balls for your clients for tax season. Dental office – floss, toothbrushes, and toothpicks? Auto shop – tire gauges, micro-tool sets and emergency kits. 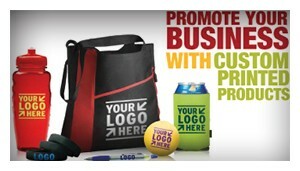 Promotional products provide the ability to translate a brand’s identity, message, and presence into a tangible item. The effects of advertising with gifts like these go beyond that, and in fact, their use is one of the fastest-growing forms of advertising today. Not sure what kind of product you’re looking for? Cagle Designs offers over 20,000 products to choose from. You name it we can find it. Have a specialty event coming up? Want something unique? Let us know your theme, industry and who will be coming and we’ll help you work something up special. Cagle Designs can help you find new and unique items that fit your business image.